Cycling has been quite a bit in the news lately, thanks to the activities of several individuals and organisations trying their best to popularise cycling. I often cycle to work – so I though I would write about my experience and perhaps dispel some of the myths associated with cycle commuting. Ramesh Sreekantan, a cycling enthusiast. Isn’t it far? It takes me about 40 minutes to drive and 45 minutes to bike. So the difference in time is not really significant. Coming back takes a little longer as it is uphill, but at that point time is not so much of a constraint. While driving, traffic is a serious consideration -while cycling it is a non-issue. It takes essentially the same time regardless of the traffic since its always possible to bypass a jam. If push comes to shove, one can always carry ones bike past an obstruction. Isn’t it tiring to work after cycling? No. On the contrary, when I drive I am often tired, irritated and stressed. When I cycle I feel awake, energised and refreshed. A colleague of mine thought he would cycle twice a week instead of driving but now cycles a distance of 40 km a day four times a week because he found it so much more relaxing than driving. Isn’t it hard?- No. The first few days it can be a little difficult but your legs will rapidly adjust. I find the hardest thing about cycling is overcoming the psychological barrier to getting on the cycle in the morning. This requires some discipline – but there has not been a day when I have regretted cycling. Sometimes I lose the battle and drive – but often I regret it the moment I leave the house. Then I find myself praying for a heavy afternoon downpour so as to justify my choice! Isn’t it dangerous to cycle in Bangalore? No. I’ve been cycling for the last year and there has not been a single occasion when I have felt unsafe. I had an accident once – but that was when someone deliberately hit me while starting because I asked him not to park in a bus stop. As long as one takes a few precautions – and stays away from vigilantism – it is quite safe. A helmet is a must. Also, cyclists often believe that they do not have to obey traffic rules – they run red lights and go the wrong way on a one way. This is very dangerous behaviour and is what often leads to accidents. Wearing cycling gear – helmet, shiny lights, bright coloured shirts with reflectors – may make you look like someone who has landed from outer space – but it gets you noticed -which is the most important thing. If they see you they are unlikely to knock you over. So it is important to be visible. I ride on the Outer Ring Road – which many may believe is unsafe – but in fact it is not. The road is very wide so there is ample space to avoid the fast moving traffic. The only danger is that due to bad design or rule enforcement in some parts autos and two-wheelers come the wrong way in order to avoid driving some distance in the direction opposite to what they wish to go and they tend to stick to the left of the road where I cycle. What do you do if you have to carry stuff? I carry a few books, papers and a laptop. For this I use a pannier – which is a French word for a bicycle pack. There are various kinds of panniers available which can carry plenty of stuff – from a few books to enough to sustain you for a week. Aren’t you sweaty when you get to work? This I cannot deny. Yes, one does get a little sweaty – but in fact, its not as bad as might think. I usually wear a sweat wicking T-shirt which causes most of the sweat to blow off. I carry a change of clothes and use a towel to wipe myself before changing or take a shower if I can. Many offices have shower facilities nowadays as well – so a quick shower at work makes you feel quite refreshed. Isn’t it really polluted and aren’t you worried about your lungs? Yes, pollution is pretty awful. But there are several ways around this. Often, on a cycle, one can avoid heavily trafficked major roads by taking smaller side roads. There also exist various kinds of pollution masks. Personally, I don’t like using them but that is a solution. However, the more people cycle to work – the less pollution there will be. Aren’t new bikes expensive? Not really. Do the math, as they say. A good new bike – one that can be reliably used for commuting – costs around 25-30 thousand. If you commute, say, 10 km to work each way, that’s 20 km a day. Five days a week means a 100 km a week. Most cars give around 15 km a litre. So 100 km means about 7 litres. At today’s price of slightly over Rs 70/litre -it means a person who drives a car spends Rs. 500 a week on petrol. That is Rs. 24000 a year! So in little over a year you will recover the cost of your cycle – just in petrol costs. And the collateral health benefits will save you thousands on medical expenses. Of course the bikes which are so expensive are the high end, typically imported bikes. You can get cycles for a lot less – for around Rs.5,000 or less. However, there are drawbacks. What makes a cycle expensive are the components. If the components are not so good, then they will break down on you – and perhaps dissuade you from cycling. If the bike is heavy, or does not have gears, you will struggle and once again may be dissuaded. Bangalore is quite hilly so having gears are quite useful. In my opinion if your need a bike to go around your neighbourhood for shopping or just getting around, any bike is ne. But if you want to use it for a regular commute of 10 km or more, a high end bike is well worth the investment. Finally, if you spend 30K on a bike you will feel guilty if you do not use it – so it helps motivate you to get on to the bike in the morning. Isn’t ***** nagara/halli/mangala/pete/gudi so far away? No. distances in Bangalore are really quite small. For instance, The distance from Malleswaram to Forum Mall in Koramangala is about 12 km. Jaynagar is also around 12 km. The other day I went to Chamrajpet – a distance of around 8 km – for a wedding. It took over an hour by car – owing to the disastrous traffic management in the city and peak traffic time. On a cycle it would have taken at most half an hour as one can go through certain areas in the city centre which are impossible to drive through. Are you certifiably insane? The jury is out on that one – though I think it’s one of the few things that keeps me sane. Cycling is a really pleasurable endeavour – in spite of the fact that conditions are not ideal in Bangalore today. A few weeks ago, while cycling back on the outer ring road I noticed an old woman was smiling at me while she crossed the road. I was wondering what was so funny when I realised I was just grinning from the sheer pleasure of riding. It keeps you healthy. My colleague who took up cycling took part in some of the ‘brevets’ – a French word for a long race – usually 100, 200 or 300 km. And won a couple – in spite of being twice as old as most of the other competitors! At Cycle Day recently, there was an 81 year old gentleman who took up riding at the age of 64. He now runs marathons and doesn’t look a day over 60! Clearly people miss it. Often when I have stopped at a red light people look at my bike wistfully. They are reminded perhaps of their youth when they rode bicycles all over the place – but at some point stopped and are now wondering why. I suppose its because there is a perception that its difficult, unsafe, time consuming or impractical. I don’t believe that is the case for the first three, but I guess it could be impractical for some. Who said cycling is only for kids? Fun thing called cycling can solve traffic problems. Here’s how! There are many fora and NGOs working to promote cycling in the city. What is needed is to get the road infrastructure right for cycling. 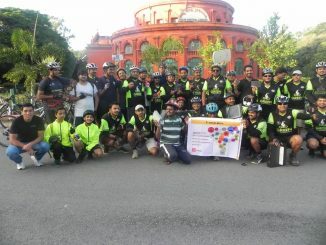 Members of GoGreenGoCycling and BinBag met at Cubbon Park on the morning of September 13th to raise awareness about the safe and responsible disposal of e-waste. Cycling to work: How to get started? If you plan to cycle your way to work in Bengaluru, here’s what you need to know. Hi – I’ll get back to you shortly. If you like you can send emails directly to me at r*****hs********n@gmail.com (where you fill in my full name). I am planning to use it more as office commute. I will be riding from BTM to Indiranagar via Inner Ring Road. As u suggested I had visited couple of shops and Decathlon. I found FireFox Rapide and BTwin Rockrider 340 under my budget and fit for my height and weight. My confusion is – Rapide is Hybrid bike with sleak tyres and 16kg weight. Btwin is 12 to 14 Kg weight and also has good shock absorber. So which one of them do u suggest? Thanks for the quick response Ramesh. I have visited Decathlon and found those quite good. But I’m not sure how good is the quality for long term usage. I will check the others mentioned by you. Thanks a ton. Hi – perhaps the best thing is to go and visit a few shops. You can check out Crankmeister, Bums on the Saddle, Pedals and Wheels, Cadence 90, RR cycles or Decathlon among others. Most good bikes are more in the 20-30K range, though Decathlon has some cheaper bikes. For instance, Decathlon has a `My Bike’ with gears for around 9K but I’m not sure how good it is. The better bike you get the more pleasure you will have and the more you will use it – so it will pay for itself shortly. I am planning to start cycling to work. I got to travel from BTM to Indiranagar which is around 10kms one way. Could you please suggest a good cycle for around 10 to 15k. I am 5.11″ and 75kgs in weight. Prashanth – i hope you use adequate lighting and wear a vest. When I ride at night I fix a blinking red light to the back of my helmet so that people can see me. Its also a good idea to use a reflective vest. And i hope you have a lot of lights. A cheap way to get some lights is to get a LED strip from an electrical shop – which you can power up with a 9V battery. Should last several hours. Great article! I agree with every point. I now have something to show to my naysaying friends. Truely inpiring and leading by example….past 1 year even I have started using bicycle for my commute…but the only constraint is i work in evening shift and have to bicycle in the midnight back home…hence commute once in a while…but weekly cover 150+ km….Have started a bicycle community in office and regularly meet for weekend rides…. Just saw your post – I usually carry a change of clothes and shower or just use a damp towel to wipe off the sweat. Sweat per say does not smell, its the bacteria smells. So if you wipe yourself with a damp towel you should be fine. Good post, i have only one doubt, how do you manage sweating and clothes if you have an important meeting later? I suppose it depends on where you cycle. You can get various kinds of masks which will lessen the amount of bad fumes you might inhale. I find them a little bit uncomfortable – but I suppose if you are willing to live with the discomfort then your lungs will last a lot longer. On my route pollution is not so bad but I can imagine if you have to cycle in to central Bangalore it could be bad. On the other hand, its not any worse than what you would inhale on a two wheeler. Well… not trying to discourage but it will really be worse than two wheeler as you will be breathing much faster so your carbon intake would be much higher as if some one is on two wheeler. Excellent write up! I used to cycle to my college (4 KM away from home) for a few months, but the pollution levels in my area and traffic made me give it up. Now I’m considering starting again!